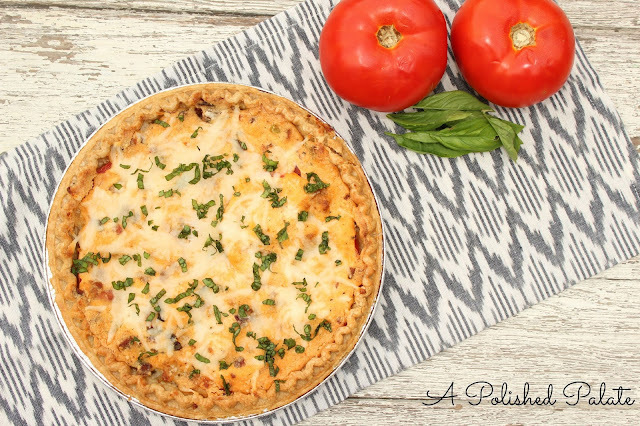 Whether it’s traditional or fancy, there is nothing better than a hot-out-of-the-oven, savory, cheesy, tomato pie. It’s a display of summer perfection. If you’ve never had one because the sheer thought of tomatoes in a pie sounds strange to you, wait no longer. This needs to be added to your bucket list - it’s that good. Tomato pies are one of my favorite summer dishes to make. When I was younger there was an elderly lady who lived down the road who would always bring us a one every year. She used to make one mean tomato pie. Back then I was more concerned with eating them than learning how to make them. As my love for cooking has grown since then, I've found myself wanting to create the perfect pie and wishing I had asked her for the recipe. I have researched tomato pie recipes, gotten tips from family and friends, and have done a little experimenting on my own. After it all, I think I’ve finally arrived at a recipe I really love. Not that you can go wrong with tomatoes and cheese. I just think it’s important that the pie isn’t too runny, but at the same time not too dry. I also like a lot of flavor in my tomato pies without it being too heavy. So, you see, it’s all about balance. After making these last pies, I think I’ve discovered a pretty darn good formula. I’ve also made some notes for next time. There are tons of recipes floating around out there, so it can't hurt to throw another one into the mix. Here’s my take on this classic Southern dish. As my mother-in-law suggests: make at least two! How do you make your tomato pies? This recipe is enough for one pie. I suggest doubling the ingredients and making two because they are rather small, not to mention delicious. I also think that using a deep dish crust would be better if you want to fit more tomatoes in the pie. I love basil, so the more, the better. I used approximately six leaves and would double it next time. 2. While the pie shell is cooking, slice the tomatoes 1/2 inch think and discard of seeds. Place the tomatoes on a paper towel, sprinkle with sea salt and let them dry for 15 to 20 minutes. 3. Meanwhile, warm a large skillet and fry 4 slices of bacon until nice and crispy. 4. Remove the bacon from the pan once cooked through and place on a paper towel to drain excess grease. 5. Dice an onion and sauté with minced garlic until translucent, cooking in the same pan the bacon was fried in. I poured out most of the bacon drippings, leaving a little to sauté the onion in. 6. Remove the garlic and onions from the pan and put to the side. 7. Take the pie shell out of the oven when finished baking. 8. Spread the garlic and onion mixture on the bottom of the pie shell. 9. Pat the tomatoes dry once more with a paper towel and layer on top of the onions, covering the entire surface area. 10. Top the tomatoes with chopped green onions, chopped basil, and sprinkle with pepper. 11. In a medium size bowl, add the ricotta, mayo, grated cheddar cheese, bacon, half of the parma rosa packet and mix well. 12. Spread the mixture over the tomatoes, coating completely covering the top. Top with mozzarella. 13. Bake the pie on 350°F for approximately 25 minutes or until golden around the edges. 14. Remove from the oven and let sit for a few minutes before slicing. 15. Top with fresh basil and/or bacon. I know what I'm making for dinner tonight! Love me some tomato pie! I always forget to let the tomatoes air dry for awhile and then I end up with a soupy, but still delicious pie! Yes, tomato pie is one of my favorites! It took me a while to figure out how to not end up with it being too soupy. Let me know how yours turns out! Yummm I love tomato pies! I love the addition of bacon! I make a really simple one (from memory now because I've made it so much hah) that's pretty much just seasonings, onion (if I have it), mayo, cheese and tomatoes. Donezo! Everything is better with bacon! :) I like your version too. It's nice to keep it simple sometimes. I just tried making tomato pie Tuesday night and I definitely didn’t plan ahead to let the tomatoes dry. Oops. These look delicious and have me convinced to give the recipe another go! Yes, that part is crucial! lol Definitely give it another try, it's worth it! yum! I am crazy over tomato pie and this looks delicious!